Being a wine grower, I am fortunate enough to be able to visit some fantastic restaurants around the world and get treated with fabulous experiences, as much with the quality of the food as with the ambience surrounding the places. Sometimes, I also get the utmost satisfaction to be able to end up a meal with a great dram of whisky. The idea of this travel column germinated on Skye in 2005, as I was spending summer holidays in a house with my family. At the time, I was extremely frustrated to witness how Skye had changed over the past 20 years, and we were going from one disappointment to the other. I almost wrote an epistle which would have looked like a game result: Islay 7 – Skye 1. The allusion was of course to Islay’s seven distilleries (not counting Kilchoman then) versus Skye only one distillery: Talisker (don’t get me wrong, I like a lot), but also to the fact that Skye’s huge tourism development has made it a paradise for camper vans and cheap & greasy foods, unlike Islay that kept it’s remote Island charm. My first visit to Skye, which was also my first time in Scotland, dates back to 1987. Margaret and I just met a few months before and decided to spend a romantic week end on a romantic Island of Scotland. We drove non-stop from London to Skye in my old Citroën CX and stayed in a charming farm B&B, just a stone throw from Talisker. When I asked the owner to advise us a place where to eat, he told us to go to the Three Chimneys Restaurant. 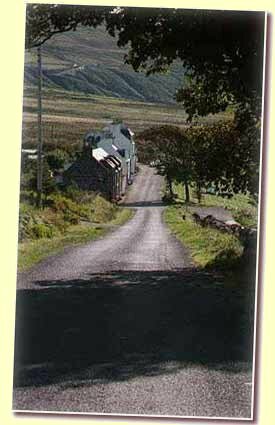 I still do not know today how we were able to find the place, but when we arrived we saw a beautiful small traditional croft. The restaurant, still the same today, is very small and has this stone wall, real fire, peat smell atmosphere. The food was incredible, mostly seafood, and the wine list was excellent, just like the list of Talisker whiskies available at the bar. The return back to the farm was memorable as we certainly drove all over the Island! Today, the Three Chimneys still has this great feel and quality of food, but attracts people from around the world, giving a more impressive and mundane atmosphere. A hotel was added next to the restaurant which makes it easier for travellers, and the place is now bursting of activity compared to 1987! During our stay in 2005, we had a few dinners at the Three Chimneys and they were all excellent. I was able to taste that superb Talisker 20yo 1981/2002 (62%, OB, 9000 Bts.) again that won the MM Awards a few years ago! On our quest in trying to escape the camper vans on smaller roads, we got lost one day in a small village on the northern shore, actually not very far from Dunvegan McLeod’s castle, called Stein (pronounced Steen). The village was in fact a short row of houses, overlooking the sea and breathtaking mountains in the distance. We couldn’t believe our luck, because in the middle of that street there was a charming little restaurant with real fire in the fireplace and, just next too it, a charming little pub. We booked for that evening (advisable as it is very small (www.lochbay-seafood-restaurant.co.uk/) and we were able to sample a delicious sea food platter followed by locally caught lobsters. Absolutely everything was perfect there! Much later, we realized that this restaurant is now managed by the former owner of Arisaig House near Mallaig, one of Scotland great hotel, now closed. Going out of the restaurant, we walked straight in the crowded bustling little pub (http://www.stein-inn.co.uk/). I prayed for a good list of whiskies, and God must have had pity of me, as I saw, hiding amongst a few good bottles, a Highland Park. It was the Highland Park 25yo (53.5%, OB, dumpy bottle in a tube box). Out of the 4 versions I have tried, this is for me the best one. It has this classic round rich creamy toffee/light heather peat so typical of Highland Park. The palate is round and has very good length. Of course, it is far from the older versions of the 80’s, but still is much more complex and interesting than the recent 25yo OB. I know that I must have been terribly prejudiced when I scored it 94 points , but this score reflects how I felt then.